Do you know what's annoying? When you spot a nice drop-leaf table in someone's trash pile, but you foolishly continue on to the grocery store intending to swing back when you finish. You shop quickly, load the car, and find out that the battery has died while you were in the store. Your husband arrives like a gallant hero and jumps the car,, but it is too late. The table is gone. I may have lost that pretty little table, but I did unearth a treasure last week. 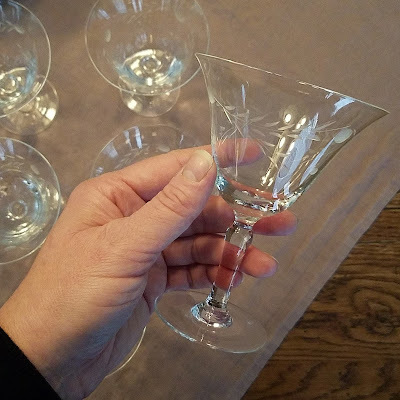 I found fourteen gorgeous handcut glasses at the hospital's thrift shop yesterday. They were each $1 and one has a little sticker on it that says WT GRANT, JAPAN on it. I have been looking for elegant little glasses like these for quite some time. We love to have sparkling apple cider with our Sunday dinners, holy days, and holidays, and these are the perfect size! I quite enjoyed washing each glass carefully and then arranging them in our china cabinet. I love how everything looks! 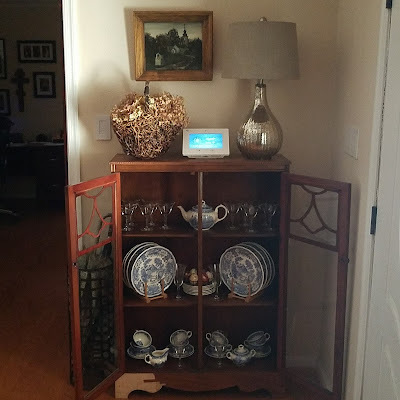 I would like to get two more bamboo racks to hold the saucers on the bottom shelf and it would be nice to figure out home to repair or replace the edging that came off the bottom of the cabinet at some point. That being said, I am so please that we now have there pretty glasses to use with out Sunday dishes!